2019-01-10 First worldwide family litigation filed litigation Critical https://patents.darts-ip.com/?family=40122148&utm_source=google_patent&utm_medium=platform_link&utm_campaign=public_patent_search&patent=US20100204312(A1) "Global patent litigation dataset” by Darts-ip is licensed under a Creative Commons Attribution 4.0 International License. This application claims priority to U.S. Provisional Application Ser. Nos. 60/938,635, filed May 17, 2007, and 60/988,071, filed Nov. 14, 2007, the disclosures of which are incorporated herein by reference. FIG. 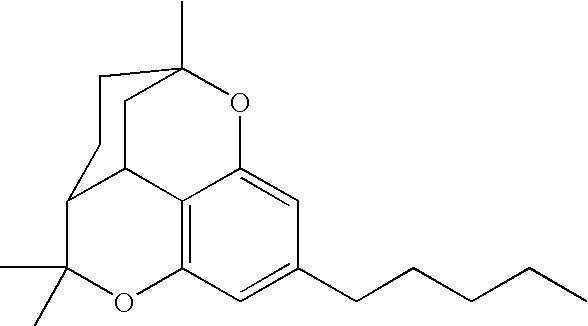 4A-C shows combination treatment of Δ9-THC and CBD specifically inhibits ERK activity. 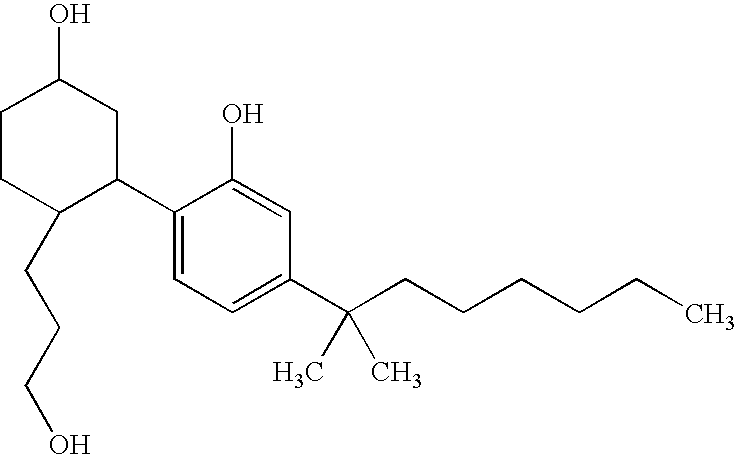 The effects of cannabinoids on MAPK activity were analyzed using Western analysis. U251 cells were treated with vehicle or a combination of Δ9-THC (1.7 μM) and CBD (0.4 μM) for two days. Proteins were extracted and analyzed for A) pERK and total ERK, B) pJNK 1/2 and p38 MAPK. U251 cells were treated with Δ9-THC (1.7 M) and CBD (0.4 M) alone and analyzed for C) pERK and total ERK. Either α-tubulin or -actin was used as a loading control (LC). Blots are representative of at least 3 independent experiments. 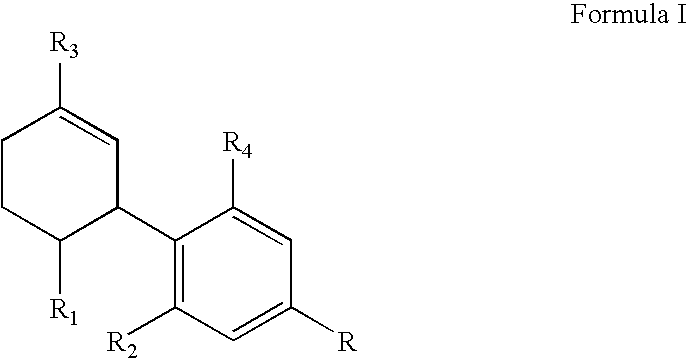 —OR where R=H, alkyl, aryl, or acyl; for example, R can be an acyl yielding —OCOR* where R* is a hydrogen or an alkyl group or an aryl group and more specifically where R* is methyl, ethyl, propyl, butyl, or phenyl groups all of which groups are optionally substituted. It was determined that Δ9-THC and CBD act synergistically to inhibit the growth of multiple GBM cell lines. 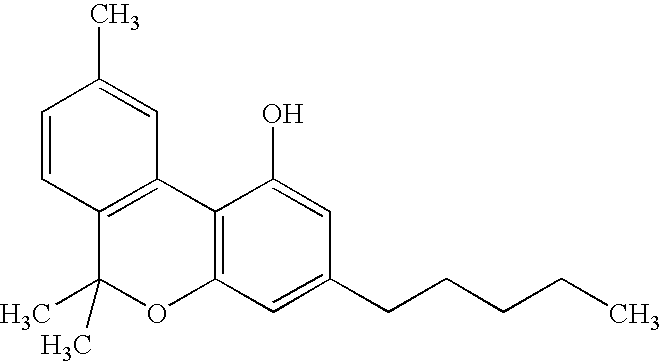 It has been suggested that non-psychoactive cannabinoid constituents can either potentiate or inhibit the actions of Δ9-THC (Krantz et al., 1971; Jones and Pertwee, 1972; Poddar et al., 1974; McPartland and Russo, 2001). The CB1 and CB2 receptor agonist, Δ9-THC, can inhibit GBM growth in vitro and in vivo. CBD, a cannabinoid constituent with negligible affinity for CB1 and CB2 receptors can also inhibit the growth of GBM in vitro and in vivo. The disclosure demonstrates that of the non-psychoactive cannabinoids, CBD was the most potent inhibitor of GBM cell growth. 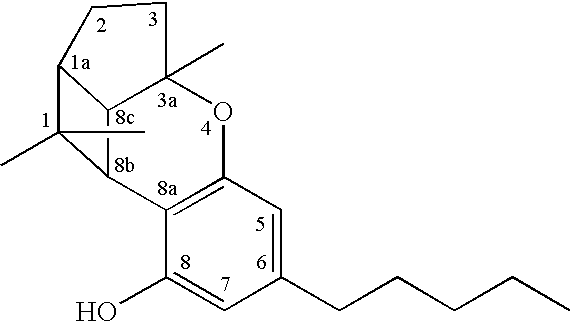 Therefore, next the positive and negative aspects of constituent interaction was determined by testing multiple different concentration combinations of Δ9-THC and CBD in a 2×2 design. The three GBM cell lines that were originally used to screen the antiproliferative activity of individual cannabinoid (Table 1) were next used to determine the effects of combination treatments. When applied in combination, Δ9-THC and CBD produces synergistic inhibition of cell growth in SF126 and U251 cells but not in U87 cells (FIG. 3, Panels A, B, C). Concentrations of Δ9-THC and CBD alone that produce only minimal effects on cell proliferation were combined and further tested in a 2×2 factorial design in the positive responding cell lines (SF126 and U251) (FIG. 3, Panels D, E, F). The most pronounced synergistic activity was observed with U251 cells, therefore, this cell lines was used to determine the mechanism of action for the combination effect. 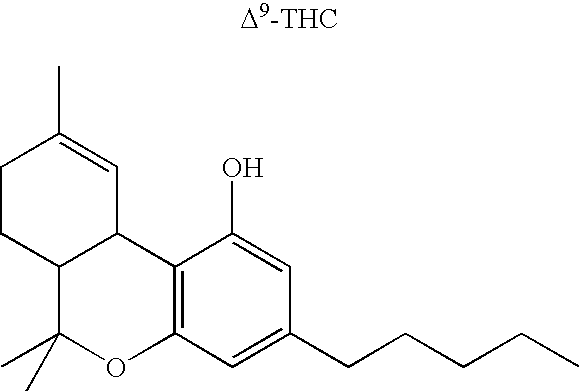 The 4:1 (1.7 M:0.4 M) ratio of Δ9-THC and CBD was used for the remainder of the experiments. Apoptosis produced by the combination of Δ9-THC and CBD was partially blocked by the CB2 receptor antagonist, SR144528, and fully reversed in the presences of -tocopherol (oxygen radical scavenger) (FIG. 4). The vanilloid receptor antagonist, capsazepine did not block any of the effects observed with the combination treatment. Cell culture and treatments: Human breast cancer cells lines MDA-MB231 and MDA-MB436 obtained from the ATCC were used. To prepare the MDA-MB231-Id-1 cells, cells were infected with a pLXSN-Id-1 sense expression vector. In all experiments, the different cell populations were first cultured in RPMI media containing 10% fetal bovine serum (FBS). On the first day of treatment the media was replaced with vehicle control or drug in RPMI and 0.1% FBS. 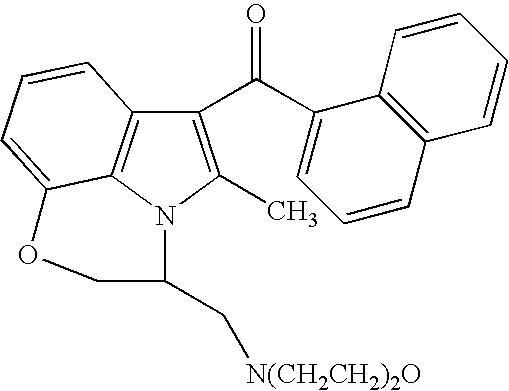 The media with the appropriate compounds were replaced every 24 h. Δ9-THC, CBN, CBD, CBG, and CP55,940 were obtained from NIH through the National Institute of Drug Abuse. WIN55,212-2 was purchased from Sigma/RBI (St. Louis, Mo.). MTT assay: To quantify cell proliferation the MTT assay was used (Chemicon, Temecula, Calif.). Cells were seeded in 96 well plates. Upon completion of the drug treatments, cells were incubated at 37° C. with MTT for 4 h, and then isopropanol with 0.04 N HCl was added and the absorbance was read after 1 h in a plate reader with a test wavelength of 570 nm. The absorbance of the media alone at 570 nm was subtracted, and % control was calculated as the absorbance of the treated cells/control cells×100. Boyden chamber invasion assay: assays were performed in modified Boyden Chambers (BD Biosciences, San Diego, Calif.). Cells at 1.5×104 per well were added to the upper chamber in 500 μl of serum-free medium supplemented with insulin (5 μg/ml). The lower chamber was filled with 500 μl of conditioned medium from fibroblasts. After a 20 h incubation, cells were fixed and stained. Cells that remained in the Matrigel or attached to the upper side of the filter were removed with cotton tips. Invasive breast cancer cells on the lower side of the filter were counted using a light microscope. Quantitative Western analysis: Proteins were separated by SDS/PAGE, blotted on Immobilon membrane, and probed with anti-Id-1 and the appropriate secondary antibody. Band intensity values were obtained directly from the blot using AlphaeaseFC software (San Leandro, Calif.) or from film using Image-J (NIH, MD). As a normalization control for loading, blots were stripped and re-probed with mouse alpha-tubulin (Abcam, Cambridge, Mass.). Polymerase Chain Reaction: Total cellular RNA was isolated from breast cancer cells treated with vehicle control or with CBD. Transcripts for Id-1 and for β-actin were reverse transcribed using SuperscriptII Reverse TranscriptaseIII (Gibco-BRL), and polymerase chain reaction performed. The 5′ and 3′ PCR primers were AGGTGGTGCGCTGTCTGTCT (SEQ ID NO:1) and TAATTCCTCTTGCCCCCTGG (SEQ ID NO:2) for Id-1; and GCGGGAAATCGTGCGTGACATT (SEQ ID NO:3) and GATGGAGTTGAAGGTAGTTTCGTG (SEQ ID NO:4) for β-actin. PCR was performed in buffer containing 1 μM of each of the 5′ and 3′ PCR primer and 0.5 U of Taq polymerase using 25 cycles for amplification of Id-1 and β-actin cDNAs. The cycle conditions were 45 sec denaturation at 94° C., 45 sec annealing at 55° C., and 1 min extension at 72° C.
Id-1 promoter reporter assays: A SacI-BspHI fragment of 2.2 kb corresponding to the 5′ upstream region of human Id-1 gene and driving a luciferase gene in a PGL-3 vector (Promega) has already been described (Id-1-sbsluc). Cells were plated in six well dishes in medium supplemented with 10% FBS and 5 μg/ml insulin. After 24 h, cells were cotransfected with 6 μg of luciferase reporter plasmids and 2 μg of pCMVβ (Clontech) using superfect reagent (Qiagen). pCMVβ contained bacterial β-galactosidase and served to control for variation in transfection efficiency. 3 h after transfection, the cells were rinsed twice with PBS and were cultured in the absence or presence of CBD for 48-72 h. Cell pellets were lysed in 80 μl of reporter lysis buffer (Promega) for 10 min at room temperature. Lysed cells were centrifuged and supernatants harvested. Luciferase and β-gal assays were performed using Luciferase Assay System (Promega), β-Gal Assay Kit (Clontech) and a 2010 luminometer (Pharmingen). Statistical analysis: The IC50 values with corresponding 95% confidence limits were compared by analysis of logged data (GraphPad Prism, San Diego, Calif.). When just the confidence limits of the IC50 values overlapped significant differences were determined using unpaired Student's t-test. Significant differences were also determined (Prism) using ANOVA or the unpaired Student's t-test, where suitable. Bonferroni-Dunn post-hoc analyses were conducted when appropriate. P values <0.05 defined statistical significance. Cell culture and treatments: The human GBM cell lines used were SF126, U87 and U251. Cell lines were maintained at 37° C. and 5% CO2. In all experiments, the different cell populations were first cultured in RPMI media containing 10% fetal bovine serum (FBS). On the first day of treatment the media was replaced with vehicle control or drug in RPMI and 0.1% FBS. The media with the appropriate compounds were replaced every 24 h. Δ9-THC, CBN, CBD, CBG, and CP55,940 were obtained from NIH through the National Institute of Drug Abuse. WIN55,212-2 was purchased from Sigma/RBI (St. Louis, Mo.). 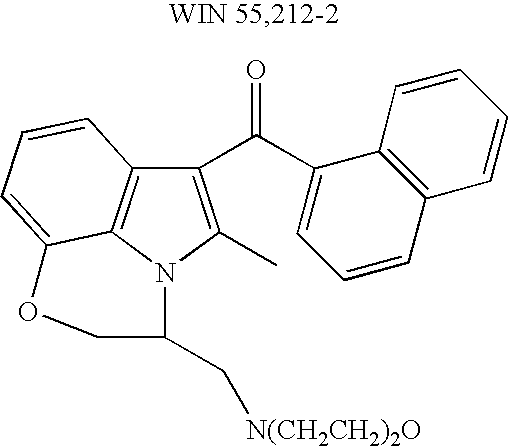 MTT assay: To quantify cell proliferation the 3-[4,5-dimethylthiazol-2-yl]-2,5-diphenyl tetrasodium bromide (MTT) assay was used (Chemicon, Temecula, Calif.). Cells were seeded in 96 well plates at 1×103 cells/well for seven day experiments and 3×103 cells per cm2 for three day experiments to obtain optimal cell density throughout the experiment. Cells were incubated at 37° C. with MTT for four hours, and then isopropanol with 0.04 N HCl was added and the absorbance was read after one hour in a plate reader with a test wavelength of 570 nm. The absorbance of the media alone at 570 nm was subtracted, and % control was calculated as the absorbance of the treated cells/control cells×100. Apoptosis: Cells were grown in 6 well culture dishes and were treated with the appropriate compounds every 24 hours for three days. The cells were trypsinized, washed with PBS, and processed for labeling with fluorescein-tagged UTP nucleotide and PI by use of an Apo-Direct apoptosis kit obtained from Phoenix Flow Systems (San Diego, Calif.) and was used according to the manufacturer's protocol. The labeled cells were analyzed by flow cytometry. Cell Flow Cytometry in combination with PI and annexin staining was used to quantify the percentage of cells undergoing apoptosis in control and treatment groups. % control was calculated as annexin positive staining in treated cells/control cells×100. PI staining was used to distinguish necrotic cells from those undergoing apoptosis. Quantitative Western analysis: Cells cultured and treated in 6-well dishes were washed twice with cold PBS. Lysis buffer was added and cells lysed by freezing for 10 min at −70° C. and then thawing. Cell lysate was collected and the concentration was determined using Bradford reagent. Equal amounts of protein were heated to 90° C. in Laemmli sample buffer with β-mercaptoethanol, and loaded onto a precast SDS-PAGE gel (Bio-Rad Laboratories, Hercules, Calif.). Protein was transferred to an Immobilon membrane (Millipore, Billerica, Mass.) overnight at 2-4° C. Blots were then blocked with 5% nonfat dry milk in TBS+Tween for 1 h. Primary antibody from Millipore (rabbit anti-phospho-JNK, rabbit anti-phospho-p38, rabbit anti-phospho-ERK1/2 and rabbit anti-ERK1/2, 1 mcg/mL) in blocking buffer was then added for 1 h. The blots were then rinsed three times 10 min with TBS+Tween. Secondary antibody (Donkey Anti-Rabbit IgG, Jackson Immunoresearch, West Grove, Pa.) was then added. Blots were incubated for 45 min and then washed 4 times for 15 min each. The blots were developed with SuperSignal Femto (Pierce, Rockford, Ill.), and imaged on either a Fluorchem 8900 (Alpha Innotech, San Leandro, Calif.) or ECL Hyperfilm (Amersham-Pharmacia, Piscataway, N.J.). Band intensity values were obtained (after background subtraction) directly from the Fluorchem 800 using AlphaeaseFC software (San Leandro, Calif.) or from film using Image-J (NIH, MD). As a normalization control for loading, blots were stripped and re-probed with mouse alpha-tubulin (Abcam, Cambridge, Mass.) and goat anti-mouse IgG (Jackson Immunoresearch) for the primary and secondary antibodies, respectively. Cell cycle analysis. U251 cells were grown in Petri dishes (100 mm×15 mm) and received drug treatments for 2 days. On the third day, the cells were harvested and centrifuged at 1200 rpm for 5 minutes. The pellet was washed 1× with PBS+1% BSA, and centrifuged again. The pellet was resuspended in 0.5 ml of 2% paraformaldehyde (diluted with PBS) and left to fix overnight at room temperature. The next day the cells were pelleted and resuspended in 0.5 ml 0.3% Triton in PBS and incubated for 5 minutes at room temperature. The cells were then washed 2 times with PBS+1% BSA. The cells were finally suspended in PBS (0.1% BSA) with 10 ug/ml Propidium Iodide and 100 g/ml RNAse. The cells were incubated for 30 minutes at room temperature before being stored at 4 C. Cell cycle was measured using a FACS Calibur using Cell Quest Pro and Modfit software. Radical oxygen species (ROS) measurements. 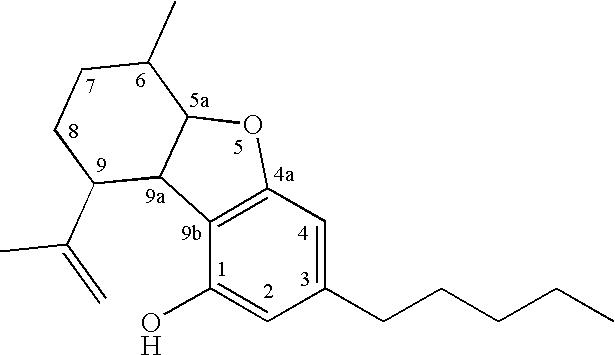 The production of cellular radical oxygen species (ROS)/H2O2 was measured using 2′-7′Dichlorodihydrofluorescein (DCFH-DA, Sigma Aldrich). 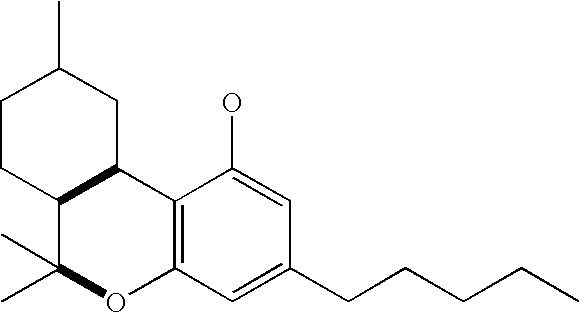 DCFH-DA is deacylated intracelluarlly into a non-fluorescent product, which reacts with intracellular ROS to produce 2′-7′Dichlorofluorescein. 2′-7′Dichlorofluorescein remains trapped inside the cell, and can be measured quantitatively. U251 cells were plated onto 6 well dishes and received drug treatments for three days. On the third day, 2 M DCFH-DA was added to the media (MEM with 0.1% FBS) and the cells were incubated with DCFH-DA overnight. The next day, the cells were trypsinized, washed with PBS, and the fluorescent intensity was measured using a FACS and cell quest pro software. 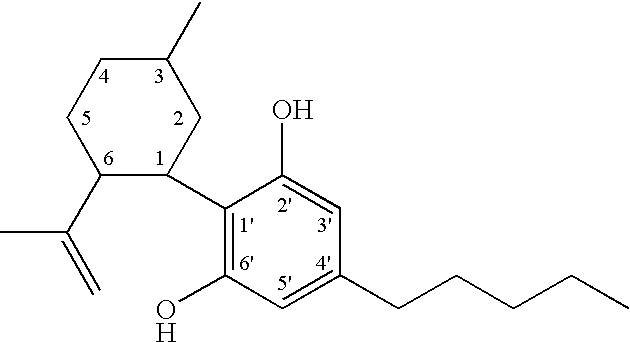 Statistical analysis: Treatment groups were divided into 1) no treatment (control), 2) Δ9-THC alone, 3) CBD alone, 4) Δ9-THC and CBD combined. Positive and negative aspects of constituent interaction were determined in this 2×2 design using 2-way analysis of variance as described by (Slinker, 1998). In the proliferation assays, IC50 values with corresponding 95% confidence limits were calculated using non-linear analysis of logged data (GraphPad Prism, San Diego, Calif.). Significant differences were also determined using ANOVA where suitable. Bonferroni-Dunn post-hoc analyses were conducted when appropriate. P values <0.05 defined statistical significance. 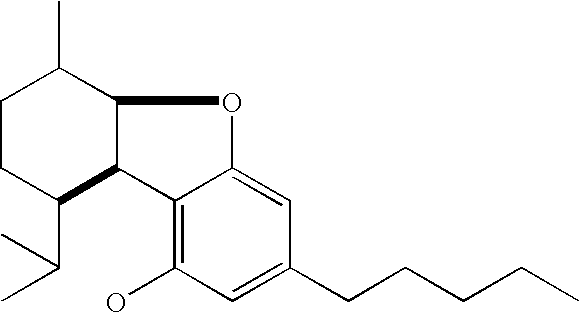 The combination treatment of Δ9-THC and CBD produces the activation of multiple caspases. Caspases play a primary role in the regulation of programmed cell death. Therefore, multiple caspase pathways were evaluated to determine mechanisms by which the combination treatment increased apoptosis (FIG. 9). Treatment with the combination of Δ9-THC and CBD led to a significant up-regulation of caspase 3, 7, and 9 activity as well as an increase in PARP. Small increases in the activity of caspase 7, caspase 9 and PARP but not caspase 3 were observed when U251 cells were treated with the individual concentration of Δ9-THC. In the presence of CBD alone no changes in caspase activity were observed. 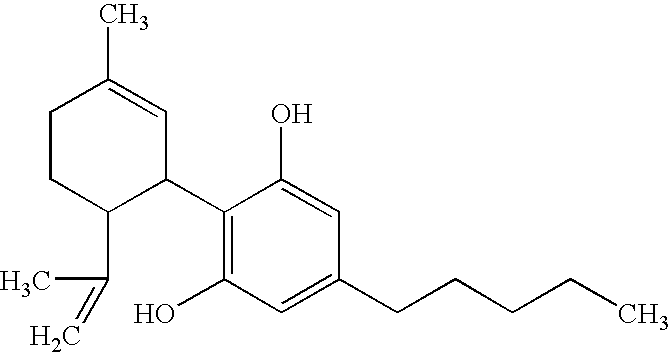 An increase in apoptosis produced by the combination of Δ9-THC/CBD were partially dependent on CB2 receptor activation. Apoptosis produce by treatment of Δ9-THC alone was also partially dependent on CB2 receptor activation. Importantly, the induction of apoptosis in the presence of the combination treatment was significantly greater than that observed with Δ9-THC alone. Apoptosis produced by CBD in U251 cells was not dependent CB2 receptor activation. Comparable results with CBD were also observed using another GBM cell line, SF126 (data not shown). 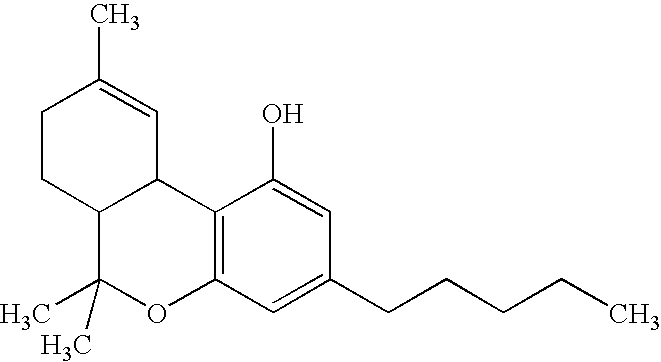 Apoptosis produced by the combination of Δ9-THC and CBD was greatly dependent on the production of oxidative stress and resulted in the activation of both extrinsic and extrinsic caspase pathways. 1. A method of treating cancer in a subject, comprising administering to a subject in need of such treatment a therapeutically effective amount of a composition comprising an agent that modulates the expression and/or activity of an Id helix-loop-helix polypeptide. 2. The method of claim 1, wherein the agent is a cannabinoid, or derivative thereof. 3. 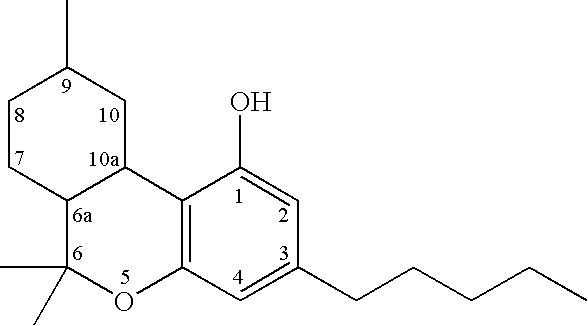 The method of claim 2, wherein the cannabinoid is cannabidiol or derivative thereof. 5. The method of claim 1, wherein R1, R2, R3, R4, are each independently selected from the group consisting of: H, —OH, aryl, substituted aryl, alkyl, substituted alkyl, carboxyl, aminocarbonyl, alkylsulfonylaminocarboxyl, and alkoxycarbonyl and wherein R is an alkyl, or substituted alkyl of at least 6 carbon atoms. 6. The method of claim 1, wherein the cancer is an Id-1-associated cancer. 7. The method of claim 6, wherein the Id-1-associated cancer is selected from the group consisting of Leukemia, Melanoma, Squamous cell carcinoma (SCC), Hepatocellular carcinoma, Colorectal adenocarcinoma, Pancreatic cancer, Lung cancer, Kidney cancer, Medullary thyroid cancer, Papillary thyroid cancer, Astrocytic tumor, Neuroblastoma, Ewing's sarcoma, Ovarian tumor, Cervical cancer, Endometrial carcinoma, Breast cancer, Prostate cancer, and Malignant seminoma. 8. The method of claim 6, wherein the cancer is breast carcinoma. 9. The method of claim 1, wherein the cancer is brain cancer. 10. The method of claim 9, wherein the brain cancer is glioblastoma multiforme. 11. The method of claim 1, wherein the subject is a human. 12. 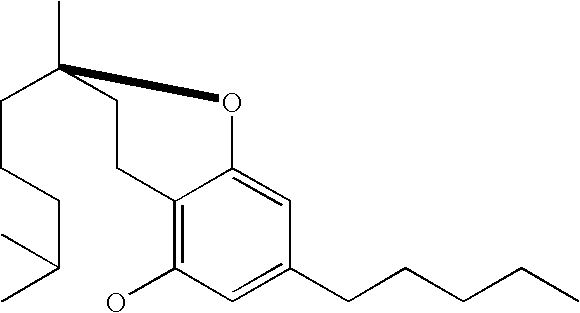 The method of claim 1, further comprising administering a THC or derivative thereof. 13. 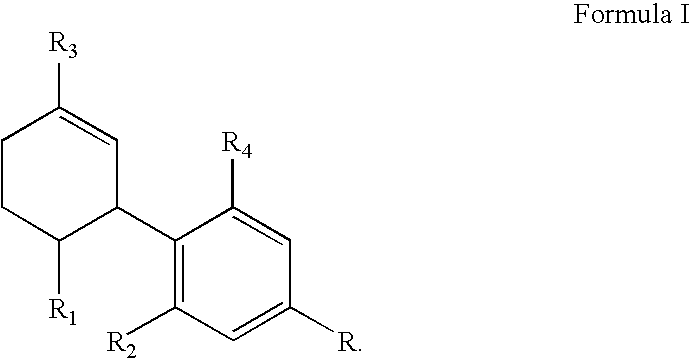 The method of claim 1, wherein the composition further comprises an effective amount of paclitaxel. 14. The method of claim 1, wherein the agent modulates the expression and/or activity of an Id helix-loop-helix polypeptide by inhibiting expression of a nucleic acid sequence encoding an Id helix-loop-helix polypeptide. 15. The method of claim 1, wherein the Id helix-loop-helix polypeptide is Id-1, Id-2, Id-3 or Id-4. 17. 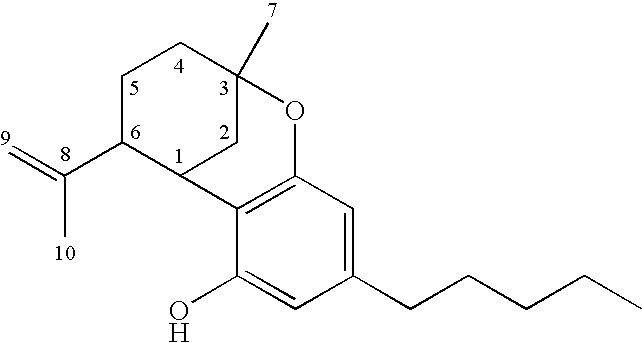 A method of treating cancer in a subject, comprising administering to a subject in need of such treatment a therapeutically effective amount of a composition comprising a cannabidiol or derivative thereof and a THC or a derivative thereof. 19. The method of claim 18, wherein R1, R2, R3, R4, are each independently selected from the group consisting of: H, —OH, aryl, substituted aryl, alkyl, substituted alkyl, carboxyl, aminocarbonyl, alkylsulfonylaminocarboxyl, and alkoxycarbonyl and wherein R is an alkyl, or substituted alkyl of at least 6 carbon atoms. 20. The method of claim 17, wherein the cancer is an epithelial cell cancer. 21. The method of claim 20, wherein the epithelial cell cancer is selected from the group consisting of melanoma, breast carcinoma and lung carcinoma. 22. The method of claim 21, wherein the cancer is breast carcinoma. 23. The method of claim 17, wherein the cancer is brain cancer. 24. The method of claim 23, wherein the brain cancer is glioblastoma multiforme. 25. The method of claim 17, wherein the subject is a human. 29. 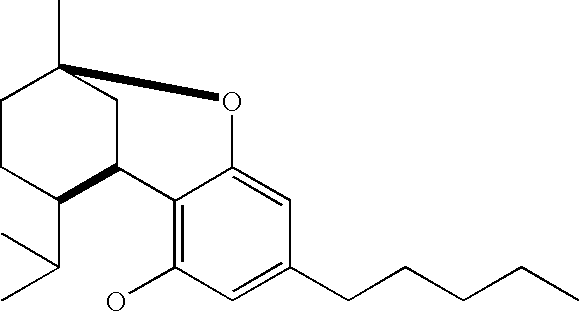 The method of claim 17, wherein the composition further comprises an effective amount of paclitaxel. 31. 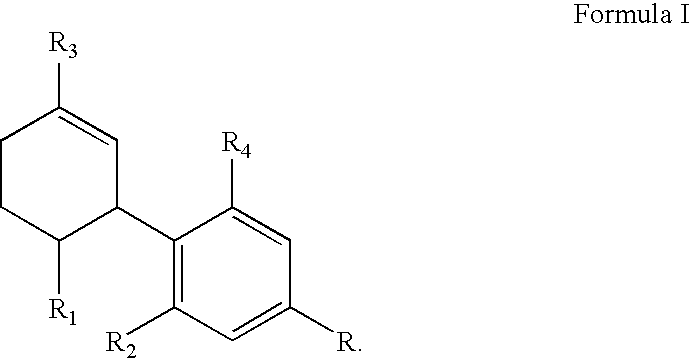 The compound of claim 30, wherein R1, R2, R3, R4, are each independently selected from the group consisting of: H, —OH, aryl, substituted aryl, alkyl, substituted alkyl, carboxyl, aminocarbonyl, alkylsulfonylaminocarboxyl, and alkoxycarbonyl and wherein R is an alkyl, or substituted alkyl of at least 6 carbon atoms. 32. A compound comprising the compound of claim 30 and a pharmaceutically acceptable carrier. 33. 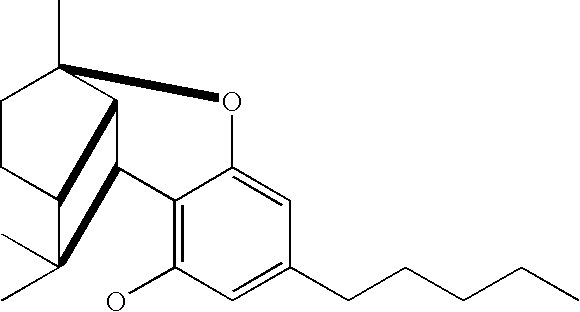 The compound of claim 32, further comprising a tetrahydrocannabinol (THC) or a derivative thereof. 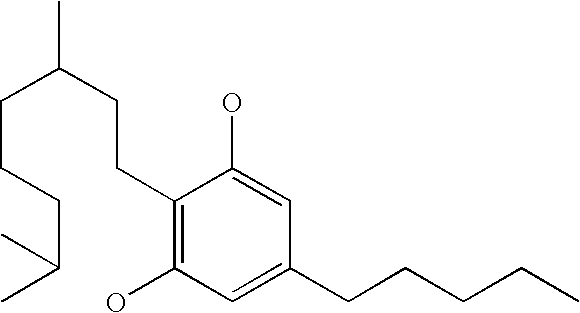 ES2164584A1 (en) 2000-02-11 2002-02-16 Univ Madrid Complutense Cannabinoid therapy for the treatment of brain tumors.